ComeAllWithin.co.uk - Harlequins v London Irish, Jesters or Clowns? It is fair to say that there probably wasn't one Quins supporter who expected a win by the visitors despite the very poor form of the home side this season. 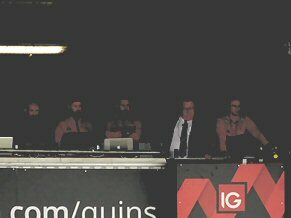 A beautiful spring afternoon, and on paper at least, a strong Quins side despite perhaps a question over the strength in the second row. Worryingly Quins are the worst performing team so far during 2018 so we should expect a close game. For me, although you always want to see your team record a win, the day was all about performance, something that has been sadly lacking for some time now. All very optimistic, but it wasn't to last long as within three minutes the Quins defence was stretched allowing Lexington to cross in the corner. Well that certainly quietened the crowd but was soon followed by a collective sigh of relief when the pass leading up to the try was correctly adjudged to have been forward. So what else happened during the remaining minutes of the first half? After ten minutes Mike Brown kicks the ball directly to touch when under no real pressure and although the Irish line out is not straight, Quins are penalised for early engagement at the resulting scrum. Irish on the front foot, Fowlie brushes past two half hearted Quins tackles before passing to scrum half Van Zyl to score the first try of the afternoon. Tommy Bell adds two more points with the conversion so after sixteen minutes Quins are seven points behind. I think this early in the afternoon we all knew where this game was heading as one of the teams looked to be there to play some rugby, the other were showing no cohesion or interest at all. Something to cheer after 20 minutes when an intercept by Joe Marchant is kicked ahead but unfortunately it is too long and Irish manage to get the touchdown. Another mistake from a Quins player leads to a second try for Irish as Tim Visser takes his eye off of the ball to spill a straightforward catch. Irish attack from the scrum and a kick to Lexington on the left wing sees him take the ball, chip it over Mike Brown and the ball holds up kindly for Van Zyl who touches the ball down for his second try of the afternoon. Another Bell conversion, Quins 0 Irish 14 after 23 minutes. At long last we see some play close to the Irish line but it falls down when Danny Care fumbles a pass by Luamanu from the base of the scrum and Irish clear the ball to the half way line. As the time approaches the 30 minute mark Irish mount another attack and yet again it results in a try as flanker Max Northcote-Green crosses the line in the corner. The try is checked by the TMO and upheld but this time the conversion attempt from Bell hits the upright, Quins 19 points behind with still 10 minutes of the half remaining. Once again Quins stray into the Irish half but as is the way these days it leads to nothing and as Irish fight back they are awarded a penalty just inside their own half. A massive kick from Bell drops a couple of feet short but he gets another opportunity right on forty minutes after Quins are penalised for holding on right in front of the posts. Only one team in this match and with the home side 22 points behind, they have a mountain to climb. Plenty for us in the stands to discuss during the break following a dismal forty minutes from Quins; my suggestion was to keep all of the coaching staff out of the dressing room and let a couple of supporters in to leave the players in no doubt as to our feelings. There must have been words in the Quins dressing room at half time as Irish had to wait a couple of minutes for the Quins side to emerge with Saili (shoulder injury) and Ward replaced by James Lang and Gray (on his 150th appearance) respectively. Quins looked more lively after the restart but it was Irish who were first to add points to the scoreboard. With only 5 minutes of the half gone, Quins are penalised for interference in an Irish line out allowing Bell to convert his third kick of the afternoon, not what the home fans were hoping to see. Despite this further set back Quins did manage a sustained period of attack but just seemed incapable of finishing off some decent lead up play until a chip into the Irish in-goal area while playing a penalty advantage led to a touchdown by Jack Clifford. Following a review by the TMO, the conversion attempt from Marcus Smith drifted wide of the uprights, Quins 5 Irish 25 with 52 minute on the clock. The start of a memorable fight back from a misfiring Quins side? Sadly not as within ten minutes Irish score their fourth try of the afternoon adding to the misery of the home supporters. If that wasn`t bad enough, Danny Care was shown a yellow card in the lead up to the score when he tackled Van Zyr who had taken a quick penalty a few metres from the Quins line. 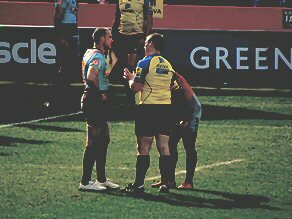 Care can consider himself lucky as his card could easily have been changed to red after back chat to referee Tempest as he left the field of play, not a good afternoon for one of the Quins senior players. Just for the record, the touchdown (or was it?) was by centre Tom Fowie with Tommy Bell adding to his personal tally for the afternoon, Irish now 27 points ahead. Major grumbles from the crowd now as well as some leaving their seats, both of which were to increase when with ten minutes left on the clock yet another penalty against Quins leads to a fairly straightforward conversion by Bell to take the Irish total to thirty five points. Another penalty to Irish straight after the restart as Charlie Matthews is adjudged to have taken Northcote-Green out in the air, result, a yellow card and Quins down to thirteen men. I have to admit that by this time my only interest was in watching the clock head towards eighty minutes so that I could head home. One final act which just about summed up the afternoon for Quins was seeing an overlap being created out on the left wing and for Chris Robshaw of all people failing to take the pass, another wasted chance. Final score, 35 well earned points for London Irish, Quins Pathetic! What an absolute shambles, one of the worst performances I have witnessed during the twenty years that I have been traipsing to The Stoop. No real interest in tackling, passed balls being thrown straight in to touch, apart from a few forays by Joe Marchant, no go forward from the backline, balls being fumbled, a far from acceptable performance in the scrum and the line out, a hat full of penalties given away, unable to catch a ball, two yellow cards – have I forgotten anything!! All of this from a squad which on paper is certainly capable of being regular top six side, this cannot be allowed to continue, something has to change. Which of course is exactly what has happened with the news that John Kingston will step down at the end of the season, is that enough, I am pretty sure that others will follow when a new DOR eventually takes over. Amongst the doom and gloom, I did notice that on at least two occasions a “not straight” call was made on the line out which seemed to be called from the assistant who positioned himself on the opposite side of the pitch and standing in line with the line out itself. The obvious place to stand rather than checking the 10 metre offside line. Just like the “not straight” put in to the scrum, so easy to police if checked sensibly. Finally I need some help, try and explain this – why on earth have I renewed my season ticket for next year as well as planning to travel to both Gloucester and Worcester for the last two away games of the season? Re: Harlequins v London Irish, Jesters or Clowns? How I remember it too. Thanks for the write up.